With one chassis option SATCO® can offer three different 3 Roller Processor configurations. There is the SAT318, SAT320 and the SAT323. Within those three different models there are further options to customise and refine your SATCO® 3 Series Processor to suit your application even further. The SAT318 Main Saw has a 36” saw bar with the option of a ¾” or 404 chain. The SAT320 and SAT323 Main Saw has a 40” saw bar with a ¾” chain. Saw limiter and auto chain tensioning is standard for all 3 Series Medium Capacity Processors. The Top Saw is a SuperCut SC100 unit with a 404 chain. 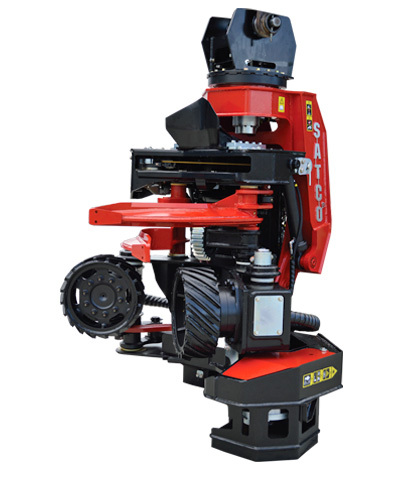 It is standard on all 3 Series Medium Capacity Processors and is known to the industry for its self adjusting feature meaning more time in the seat for the operator. All SATCO® 3 Series Harvesting & Processing Heads have been designed with robust and long service-life features. SATCO® has a unique ‘hose through centre’ connection to the base machine which allows the hoses to travel through the centre line of the attaching pins. This prevents the hoses over–bending causing premature failure and protects the hoses from damage, especially in tree felling applications. All SATCO® Processing Heads are constructed using high grade materials and manufactured using the best robotic welding wire for a far superior weld.